In the new year, you may be starting some new improvement projects for the betterment of the work and factory performance. Before you start a new improvement project and become busy with the new assignments, it would be a good idea summarising last year's data and review last year's performance. It is time to look back and review the last year's performance. How much you have achieved in the previous year. What all KPIs are not meet your goal. In which all KPIs you have beaten the last year's benchmark performance. You can analyse the available data as many as you want. A factory must review these 5 KPIs. 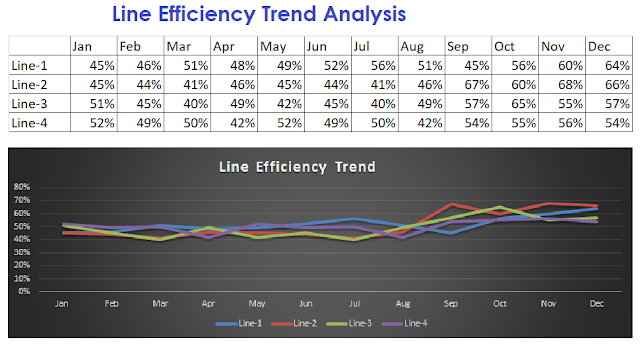 Calculate monthly line efficiency and draw a trend chart on a spreadsheet with 12 months of efficiency data. Efficiency is a common performance measure and I assume you calculate line efficiency and you have the monthly efficiency data. If not, you can calculate it now. Check this post to learn the line efficiency calculation method. You earn revenue when you ship garments. More you ship, more you earn. Review the monthly production volume and shipped quantity. Prepare a trend chart month by month. Here is an example of 100 machines factory that makes knits tops, t-shirts. To earn more profit, it is necessary to reduce garment production cost. With the continuous increase in wages, consumables and machine maintenance cost, how the production cost changing month by month. Is your production cost per garment is meeting the buyer's target cost? Assuming your factory is making a similar product range year after year. If not, still measuring cost per garment and analysing its trend is a good way of understanding the factory's performance growth. Cost per SAM is the labour cost per minute. Calculate actual labour cost per standard minute. Cost per SAM may increase due to many reasons. It may be increased due to the rise in minimum labour wages. Cost per SAM may higher in case line performance goes down due to some other reasons. With productivity growth, you need to maintain the product quality standard. So, don't miss analysing the quality performance data. For this calculate monthly percentage defective and draw a trend chart. You can also include the DHU report in the quality performance chart. If you are new to measuring key performance indicators (KPI) of your factory, you can refer to my eBook - Garment Maker's KPI - Why measure and how to measure. Once you are ready with the above 5 performance trends, go through the charts. Charts will tell you what you have achieved in the last year. You can extend the list of KPI review. Factory management must consider measuring top KPIs and reviewing data. It may be time to meet with your team and plan again to set-up a new performance benchmark. Another objective of reviewing yearly performance result, you set-up a new benchmark for each KPI. Employee performance and departmental performance can be assessed through the year KPI review. Question: Which are the most important and top 5 KPIs in your company? Data analysis and progress analysis of a garment factory by measuring yearly and monthly performance trend on primary KPIs.